When Nicole Dolack learned that her best friend, who was attending college in California, was planning to study abroad in Berlin, she decided to do the same. She chose the Berlin School of Economics and Law and applied to a Study and Internship program that allows students to spend a semester abroad studying, and then complete an internship abroad. She already knew some German, so she figured by the time she spent a semester living in Germany, her language skills would be strong enough for the workforce there too. “My study abroad advisor mentioned a scholarship from the German Academic Exchange Service (DAAD, Deutscher Akademischer Austausch Dienst) that would cover the cost of my flight and give the recipient a monthly living stipend. Determined to win the scholarship, along with my credentials, I wrote my letter of motivation in German.” She won the scholarship. The majority of her classes at the Berlin School of Economics and Law, aside from those specifically designed for foreign exchange students – which she describes as “fun electives” that she took with other students visiting from around the world – she took in German. “I remember walking into my first Internationale Wirtschaft (International Economy) class and knowing maybe every 20th word. By the end, I took a written exam and gave a presentation,” she says. When two weeks had passed with no reply from Microsoft, she started to worry. “Then I got a call on a Monday to come in that Wednesday to the Munich office for a personal interview.” Munich was seven hours away. She caught a train there the next day, stayed overnight with a friend and made it to her 9 a.m. interview. Her interviewers were impressed with her previous co-op experience at Comcast (they had both worked for GE before and were familiar with the American company). “They were also impressed by how young I was, since the position generally calls for students who already have a bachelor’s degree,” she says. After two more weeks of waiting, she finally got the call she had been hoping for: it was her new manager delivering the news that she had landed the position. “I made the huge move from Berlin to Munich, which distance-wise is comparable to Philly to Boston. 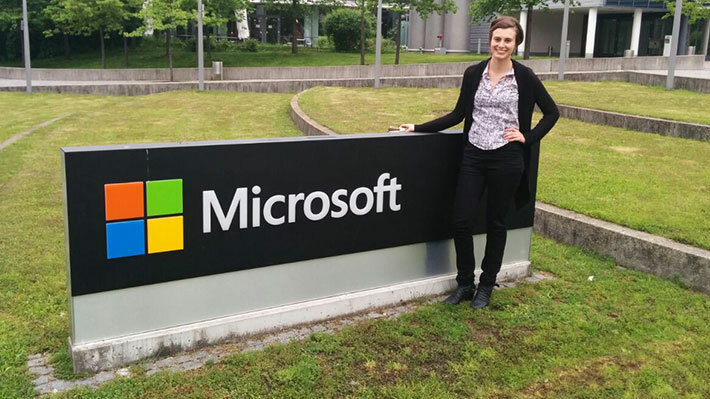 Since then I have been interning in the Finance Department of the German headquarters of Microsoft, working on financial analysis – specifically looking at external resources and comparing company segments over time. I have created budgeting models that have set the foundation for discussions with business managers.” Because this internship was a full-time work experience, Drexel counted it as one of her three co-ops.